Medulloblastoma constitutes 20% of all childhood primary CNS tumors. Metastasis of medulloblastoma can be found in both neuraxis and extraneural locations. Supratentorial metastasis is found in 14.6% of cases, intraspinal mets in 12.5%, and systemic metastasis in 9.7%. The management of patients who present with diffuse leptomeningeal spread preoperatively has not been clearly defined. 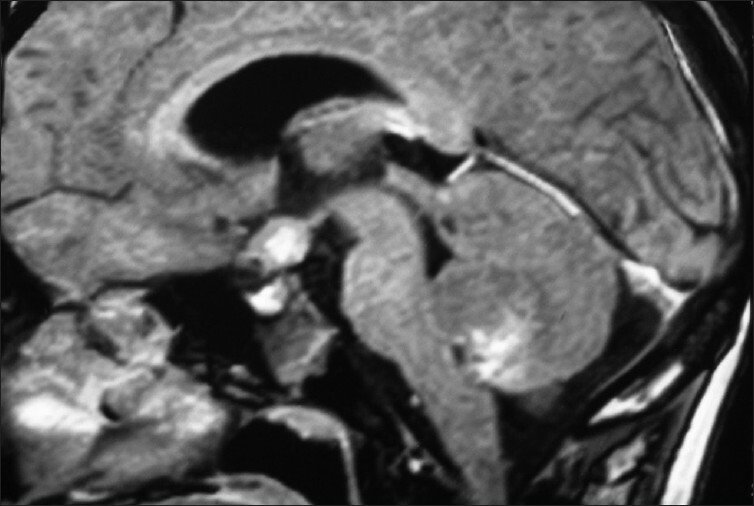 An 11-year-old boy presented with progressive headache and gait ataxia for 1 year. On examination he was found to have only cerebellar ataxia with no signs suggestive of spinal cord involvement. 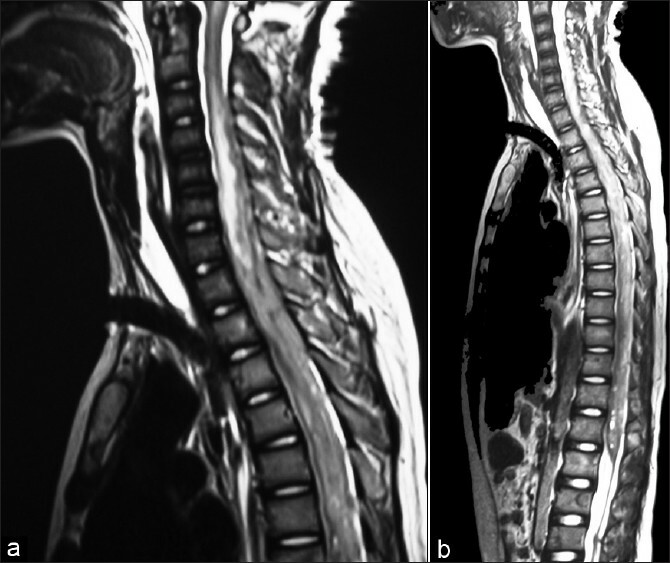 He was investigated with cranio-spinal contrast MRI, which showed three lesions, one in the region of the vermis and the other in the suprasellar region and long segment cervico-dorsal region [Figure 1], [Figure 2]a-b and [Figure 3]a-b. The lesions were hypointense on T1W, and hyperintense on T2 with heterogenous contrast enhancement. The right ventriculo peritoneal shunt was inserted as the patient had features of raised ICP with hydrocephalus. The CSF workup was normal and negative for malignant cytology. The headache improved to some extent following shunt. However, the ataxia persisted. Three days later he underwent posterior fossa craniectomy and excision of vermian mass. He was operated in prone position with flexion at atlanto-occipital joint, thereby opening up the operative site, taking care not to overflex to avoid blocking the venous drainage or airway. The intraoperative period was uneventful. The patient had paraplegia in the immediate postoperative period. The sensory loss was below first dorsal segment. There was minimal improvement in sensory loss but none in motor power in 1 week. In view of his repeat MRI spine showed no hemorrhage in the spinal lesion or in the tumor bed. The relatives did not give consent for surgery for spinal metastasis. There was minimal improvement in sensory loss but none in motor power in 1 week. In view of his lower cranial nerve palsies he was tracheostomized. Unfortunately he succumbed to trachea-innominate fistula, a week after his surgery. The uniqueness of this case lies in the fact that the spinal drop metastases were sheetlike extending from the C3 to D8 region. This patient had presented with features of only cerebellar ataxia. Postoperatively he became paraplegic. Postoperative paraplegia following nonspinal surgical procedures is very rare. The causes of postoperative paraplegia following posterior fossa surgery could be the following: intraoperative patient position, overflexion of neck and/or imbalance of the subarachnoid pressure between rostral and caudal thoracic spine, and by removing CSF at the operative site. The hydrodynamic changes that occur following a shunt placement can be speculated as another cause of paraplegia following surgery for nonspinal lesions. The current staging stratifies patients harboring these tumors in two groups, a high risk and a low risk group, with the mainstay of treatment being surgery, craniospinal irradiation, and chemotherapy. However, the exact management for patients presenting with disseminated leptomeningeal spread prior to surgery (high risk), like in our case, is not clear. Another option would be to operate on the drop metastases, especially those with long segment involvement, in the same sitting. The literature search did not reveal any studies which had dealt with this kind of management. Besides, it may not be feasible in cases with long segment involvement like in our case. Presently there is no set protocol for the management of disseminated medulloblastomas. The possibility of neoadjuvant chemotherapy and/or single sitting surgical intervention for drop metastases needs to be explored in order to improve the outcome for such lesions. 1. Kunschner LJ, Lang FF. Medulloblastoma. In Youmans Neurological surgery. 5 th ed. Philadelphia: Saunders; 2005. p. 1031-42. 2. Park TS, Hoffman HJ, Hendrick EB, Humphreys RP, Becker LE. Medulloblastoma: Clinical presentation and management: Experience at the hospital for sick children, Toronto, 1950-1980. J Neurosurg 1983;58:543-52. 3. Hsieh PC, Wu CT, Lin KL, Jaing TH, Tseng CK, Lui TN, et al. The clinical experience of medulloblastoma treatment and the significance of time sequence for development of leptomeningeal metastasis. Childs Nerv Syst 2008;24:1463-7. 4. Hongo K, Nakagawa H, Tamai K, Kobayashi S. Paraplegia following surgery for medulloblastoma in the posterior fossa. J Clin Neurosci 1999;6:522-4. 5. Hicdonmez T, Kilincer C, Hamamcioglu MK, Cobanoglu S. Paraplegia due to spinal subdural hematoma as a complication of posterior fossa surgery: Case report and review of the literature. Clin Neurol Neurosurg 2006;108:590-4. 6. Di Rocco C, Iannelli A, La Marca F, Tornesello A, Mastrangelo S, Riccardi R. Preoperative chemotherapy with carboplatin alone in high risk medulloblastoma. Childs Nerv Syst 1995;11:574-8. 7. Grill J, Lellouch-Tubiana A, Elouahdani S, Pierre-Kahn A, Zerah M, Renier D, et al. Preoperative chemotherapy in children with high-risk medulloblastomas: A feasibility study. J Neurosurg 2005;103 Suppl 4:312-8.